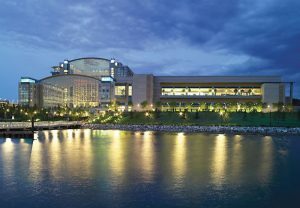 Bennett Trenchless Engineers will be presenting at the North American Society for Trenchless Technology’s Annual No Dig Conference at the Gaylord National Hotel in Washington, DC from April 9th to the 13th. On Sunday, April 9th, Matthew Wallin will be teaching the Introduction to New Installations Short Course, covering topics including horizontal directional drilling (HDD), auger boring, pilot tube, open-shield pipejacking, microtunneling, and earth pressure balance pipejacking. During the conference, Kate Wallin will be presenting a paper on the design details that can become pitfalls for small HDD projects, with application for other trenchless construction projects. On Wednesday and Thursday, David Bennett and Mary Neher will be instructors for the newly revised HDD Good Practices Short Course. The HDD course covers HDD projects from design through construction, and includes an in depth analysis of the design calculations required for analyzing risks of hydrofracture, pullback pipe stresses, and settlement.